See also PhilPapers, where I seem to be the only Norlock. I include links to some full texts of essays below, since you may want a single download for personal reading. Fair dealing for purposes such as research, private study, and education is an exception to copyright in Canada. If you need to cite accurate page numbering of publications, though, PhilPapers or Google Scholar is your better bet. Rowman & LIttlefield, International (RLI). Original contributions by authors including Myisha Cherry, Barrett Emerick, Robert Enright and Jacqueline Song, Eve Garrard and David McNaughton, Alice MacLachlan, and C. Ward Struthers, and the generous permission to reprint the work of Pumla Gobodo-Madikizela. Monograph, second ed. paperback 2018, original hardcover publication 2009. Includes chapters on Forgiveness as a Performative Utterance, Third-Party Forgiveness, Self-Forgiveness, and relational ethics. Edited Collection, co-edited with Andrea Veltman. 2009. 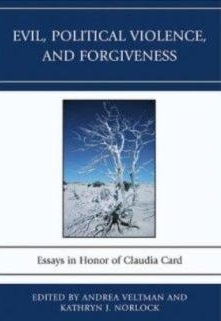 Afterword by Claudia Card. Original Contributions by Todd Calder; Ann Cudd; Eric Kraemer; Alice Maclachlan; Sarah Clark Miller; María Pía Lara; Robin May Schott; Laurence Thomas; Lynne Tirrell. Journal of Social Philosophy (Spring 2015), Special Issue: Miscarriage, Reproductive Loss, and Fetal Death. Co-edited with Ann J. Cahill and Byron J. Stoyles. Thanks to the Kenneth Mark Drain Chair in Ethics trust, this entire issue is free for readers and Open Access. Original contributions vetted by doubly anonymized peer review and authored by Alison Reiheld, Amy Mullin, Ann J. Cahill, Lindsey Porter, Hilde Lindemann, Byron J. Stoyles, Sarah Hardy and Rebecca Kukla, Christine Overall, and Sarah Clark Miller. Hypatia (Winter 2009), Special Issue: Oppression and Moral Agency: Essays in Honor of Claudia Card. Co-edited with Andrea Veltman. Edited original essays by authors including Samantha Brennan, Joan Callahan, David Concepcion, Vicky Davion, Marilyn Friedman, Hilde Lindemann, Sheryl Ross, and Lisa Tessman. ARTICLES, CHAPTERS, and published essays: see the CV for the full list. "Can't Complain," published in Journal of Moral Philosophy (2018, Vol. 15, Iss. 2, pp. 117 – 135). Abstract: Philosophers generally prescribe against complaining, or endorse only complaints directed to rectification of the circumstances. Notably, Aristotle and Kant aver that the importuning of others with one’s pains is effeminate and should never be done. In this paper, I reject the prohibition of complaint. The gendered aspects of Aristotle’s and Kant’s criticisms of complaint include their deploring a self-indulgent "softness" with respect to pain, yielding to feelings at the expense of remembering one’s duties to others and one’s own self-respect. I argue that complaining may also take the form of mindful attention to shared suffering. A complainer may observe affective duties, such as commiseration and invitations to disclose pains. Against more contemporary views that justify only constructive complaints directed to change, I suggest that quotidian, unconstructive complaining sometimes fulfills important social functions, including the amelioration of loneliness and affective solidarity, for the sake of others as well as oneself. "Online Shaming," published in Social Philosophy Today (2017). Abstract: Online shaming is a subject of import for social philosophy in the Internet age, and not simply because shaming seems generally bad. I argue that social philosophers are well-placed to address the imaginal relationships we entertain when we engage in social media; activity in cyberspace results in more relationships than one previously had, entailing new and more responsibilities, and our relational behaviors admit of ethical assessment. I consider the stresses of social media, including the indefinite expansion of our relationships and responsibilities, and the gap between the experiences of those shamed and the shamers’ appreciation of the magnitude of what they do when they shame; I connect these to the literature suggesting that some intuitions fail to guide our ethics. I conclude that we each have more power than we believe we do or than we think carefully about exerting in our online imaginal relations. Whether we are the shamers or the shamed, we are unable to control the extent to which intangible words in cyberspace take the form of imaginal relationships that burden or brighten our self-perceptions. "I Don't Want the Responsibility: The Moral Implications of Avoiding Dependency Relations with Companion Animals," published in Pets and People: The Ethics of Our Relationships with Companion Animals, edited by Christine Overall (Oxford University Press, 2017). Abstract: I argue that humans have moral relationships with dogs and cats that they could adopt, but do not. The obligations of those of us who refrain from incurring particular relationships with dogs and cats are correlative with the power of persons with what Jean Harvey calls “interactive power,” the power to take the initiative in and direct the course of a relationship. I connect Harvey’s points about interactive power to my application of Eva Kittay’s “dependency critique,” to show that those of us who refrain from incurring particular relationships of dependency rely on caregivers in our communities and regions to fulfill the moral and social demands that an abundance of unowned companionable animals makes on the community. "Real (and) Imaginal Relationships with the Dead," published in Journal of Value Inquiry (2017), and thanks to the proceeds of the KMD Chair In Ethics at Trent University, it's Open Access in perpetuity. Abstract: Whether and when to tell your children about your deceased abusive parent, whether and how to write to the surviving kin of an acquaintance who died, and how and why to forgive one’s deceased wrongdoer, raise complex questions as to what it means to have a relationship at all. In this essay, I advocate attention to psychologists’ conceptual analyses of imaginal relationships in order to clarify that relationships between living entities include imaginal content that endows our relationships with moral import and meaningfulness, and therefore, relationships can continue after one of the relata has died, when the survivor continues to relate to the dead in imaginal ways. Real relationships are not limited to those of reciprocity between the living. "Grading Anxious and Silent Participation: Assessing Student Attendance and Engagement with Short Papers on a 'Question for Consideration,'" published in volume 39, number 4 of Teaching Philosophy, in the December 2016 issue. Abstract: The inclusion of attendance and participation in course grade calculations is ubiquitous in postsecondary syllabi, but can penalize the silent or anxious student unfairly. I outline the obstacles posed by social anxiety, then describe an assignment developed with the twin goals of assisting students with obstacles to participating in spoken class discussions, and rewarding methods of participation other than oral interaction. When homework assignments habituating practices of writing well-justified questions regarding well-documented passages in reading assignments are the explicit project of weekly class meetings, participation increases on the part of all students. My focus shifted away from concern that I must get students to talk more, and turned instead to ensuring their marks reflected their learning rather than their speaking. Students’ improved engagement as a result of the assignment bears out evidence in the literature for active learning and for alternatives to taking attendance and quantifying participation. "The Challenges of Extreme Moral Stress: Claudia Card's Contributions to the Formation of Nonideal Ethical Theory," published in Metaphilosophy (2016) and, thanks to the proceeds of the KMD Chair in Ethics at Trent University, it's Open Access in perpetuity. This is a contribution (invited, editor-reviewed) to a special issue of Metaphilosophy co-edited by Robin Dillon and Armen Marsoobian: Criticism and Compassion: The Ethics and Politics of Claudia Card. Abstract: I argue that Claudia Card numbers among important contributors to nonideal ethical theory (NET), and I advocate for the worth of NET. Following philosophers including Lisa Tessman and Charles Mills, I contend that it is important for ethical theory, and for feminist purposes, to carry forward the interrelationship that Mills identifies between nonideal theory and feminist ethics. Card’s ethical theorizing assists in understanding that interrelationship. Card’s philosophical work includes basic elements of NET indicated by Tessman, Mills, and others, and further offers two important and neglected elements to other nonideal ethical theorists: (i) Card's rejection of the “administrative point of view,” and (ii) her focus on “intolerable harms” as forms of “extreme moral stress” and obstacles to excellent ethical lives. The essay concludes that Card’s insights are helpful to philosophers in developing nonideal ethical theory as a distinctive contribution to, and as a subset of, nonideal theory. “Doctor’s Orders: Menopause, Weight Change, and Feminism,” published in volume 9, number 2 of International Journal of Feminist Approaches to Bioethics (IJFAB), October 2016. Downloads of this pre-pub draft include the following PRODUCT WARNING: This paper was an invited narrative, anonymously peer-reviewed, but intended primarily as an illustrative story, not a philosophical essay. Readers are cautioned to expect lightheartedness, dialogue, and occasional displays of emotion. “Giving Up, Expecting Better, and Moral Transformation,” published (invited, then peer-reviewed), for Reasonable Responses, a peer-reviewed collection in honor of Dr. Trudy Govier’s philosophical career, a publication of the electronic book series Windsor Studies in Argumentation. Abstract: Trudy Govier argues for “conditional unforgivability,” yet avers that we should never give up on a human being. She says it is not only justifiable to take a “hopeful and respectful attitude” toward one’s wrongdoers, it is also objectionable to adopt an attitude that any individual is “finally irredeemable” or “could never change,” because such an attitude “anticipates and communicates the worst” (137). I appeal to Eric Schwitzgebels’ account of attitudes to argue that justifiable belief in moral agents’ capacities does not entail hopeful attitudes, and I distinguish knowledge of possibilities from attitudes which are compatible with conditional unforgivability. "Receptivity as a Virtue of (Practitioners of) Argumentation," published in Mohammed, D., & Lewiński, M. (Eds. ), Virtues of Argumentation. Proceedings of the 10th International Conference of the Ontario Society for the Study of Argumentation (OSSA), 22-26 May 2013. Windsor, ON: OSSA, pp. 1-7. Abstract: I rely on Nel Noddings’ analysis of receptivity as "an essential component of intellectual work," to argue that receptivity is a virtue of argumentation (1984, p. 34), practicing the principle of charity excellently for the sake of an author and their philosophical community. The deficiency of receptivity is epitomized by the philosopher who listens to attack. The excess of receptivity is the vice of insufficiently critical acceptance of an author regardless of the merits of an argument. “Gender Perception as a Habit of Moral Perception: Implications for Philosophical Methodology and Introductory Curriculum,” published in Journal of Social Philosophy, Vol. XLIII (3), Fall 2012, pp. 347-62. Special issue: Gender and Implicit Bias: Micro-inequalities, Covert Discrimination, and Philosophical Methodology, edited by Margaret A. Crouch and Lisa Schwartzman. Abstract: A standard objections to the inclusion of women’s work on introductory philosophy syllabi is that gender is irrelevant to philosophy. I appeal to Peggy DesAutels’s description of abstract moral perceivers, to show that the extent to which philosophers have (what I call) gender perception is affected by their basic habits of moral perception; abstract moral perceivers tend not to perceive gender matters as morally salient features of the moral landscapes of philosophy and pedagogy. Given the sorts of benefits that accrue to students of inclusive curricula, including affective engagement and academic achievement, I recommend appealing to abstract moral perceivers with arguments from fairness, impartiality and quality, to best motivate the perception that inclusive curriculum is morally and pedagogically compelling. Abstract: Aldo Leopold’s A Sand County Almanac emphasizes values of receptivity and perceptivity that appear to be mutually reinforcing, critical to an ecological conscience, and cultivatable through concrete and embodied experience. His priorities bear striking similarities to elements of the ethics of care elaborated by feminist philosophers, especially Nel Noddings, who notably recommended receptivity, direct and personal experience, and even shared Leopold’s attentiveness to joy and play as sources of moral motivation. These commonalities are so fundamental that ecofeminists can and should see Leopold as a philosophical ally; I consider and respond to feminist criticisms of Leopold, and urge attention to his recommendation to “build receptivity” as a core and feminist-friendly aspect of Leopold’s scholarship. “Self-forgiveness and Third-Party Forgiveness,” in Forgiveness: Probing the Boundaries (Oxford: Inter-Disciplinary Press, 2009), ed. by David White and Stephen Schulman. Abstract: I suggest that the possibility of self-forgiveness is only coherent in the presence of a defense of third-party forgiveness (3PF). By ‘third-party forgiveness’ I mean the act of forgiving a wrongdoer for wrongs done to someone other than the forgiving agent. Consider the case of someone who exclaims, “I’ll never forgive myself for hurting you!” Discussions of self-forgiveness often involve one’s refusal to forgive one’s own harming of another; that is, one refuses to forgive though someone else is the victim. Self-forgiveness as a form of third-party forgiveness simultaneously supports the likelihood that 3PF is possible and benefits from its defense. Philosophers of forgiveness who write about 3PF tend to reject it as, not just morally problematic, but illogical or incoherent. I consider and reject arguments against the possibility of 3PF. Philosophers’ ethical objections to 3PF do not succeed in showing 3PF is impossible, but they correctly convey the moral riskiness of 3PF and self-forgiveness. I conclude that the riskiness of both accentuates the moral importance of 3PF in general, and self-forgiveness in particular, as helpful in living with oneself and one’s own memories of wrongdoing. “Forgivingness, Pessimism, and Environmental Citizenship,” Journal of Agricultural and Environmental Ethics, 23 (1-2), 2010; Special Issue, "Virtue and Environment," guest-edited by Ron Sandler and Phil Cafaro. Abstract: Our attitudes toward human culpability for environmental problems have moral and emotional import, influencing our basic capacities for believing cooperative action and environmental repair are even possible. In this paper, I suggest that having the virtue of forgivingness as a response to environmental harm is generally good for moral character, preserving us from morally risky varieties of pessimism and despair. I define forgivingness as a forward-looking disposition based on Robin Dillon’s conception of preservative forgiveness, a preparation to be deeply and abidingly accepting yet expecting human error. 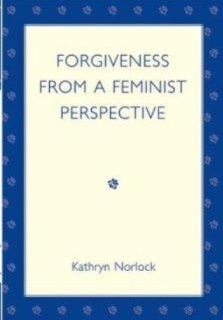 As with other virtues, however, preservative forgiveness is available to some of us more than others; in the second half of this paper, I consider the deep challenge posed by rational pessimism, especially on the part of those who have been given many reasons not to hope for the very moral improvements for which they strive. I conclude that for those of us with the power roles and personal resources especially conducive to environmental activism, preservative forgiveness inclines us to remain engaged in environmental activism with fellow flawed human beings, recognizing our own mutual depredations while committing us to cooperatively respond. “A Moral Imperative: Retaining Women of Color in Science Education,” co-authored with Profs. Angela Johnson and Sybol Cook Anderson, in Atlantis: A Women’s Studies Journal, Vol. 33 (2009). Special Issue: Women's Education/Educating Women in the post-secondary context. Abstract: We consider the experiences of a group of women science students of color who reported encountering moral injustices, including misrecognition, lack of peer support, and disregard for their altruistic motives. We contend that university science departments face a moral imperative to cultivate equal relationships and the altruistic power of science. "The Case for our Widespread Dependency," review essay, in Social Theory and Practice 30.2 (Apr 2004): 247-257. Abstract: In this review essay, I assess The Subject of Care (eds. Eva Feder Kittay and Ellen K. Feder) as a collection that does compelling work in identifying dependency as a fact of life and demonstrating its importance philosophically. At a minimum, the collection builds a case against four tenets of traditional liberalism, which I shall represent as follows: (Tl) Dependency can be avoided by adults and equals. (T2) Dependency should be avoided by adults and equals. (T3) Independence can be achieved by adults and equals. (T4) Independence should be achieved by adults and equals. The remarkable effect of the volume is the inescapable sense that we are all dependents and that the above four tenets are problematic ideals at best. This raises at least two questions, however. First, it is not clear to me whether I am correct that this is the intended effect; that is, do the contributors mean to make the case that we are all dependents, or merely that dependency is philosophically important? Second, I am interested in determining whether it is correct that we are all dependents; even if the volume does not make this case, perhaps the ideas within could contribute to establishing universal dependency. Both questions hinge on the definition of dependency, which is my focus in this essay. “The Atrocity Paradigm applied to Environmental Evils,” in Ethics and the Environment, Vol. 9 (1), 2004. Abstract: I am persuaded both by the theory of evil advanced by Claudia Card in The Atrocity Paradigm and by the idea that there are evils done to the environment; however, I argue that the theory of evil she describes has difficulty living up to her claim that it "can make sense of ecological evils the victims of which include trees and even ecosystems" (2002, 16). In this paper, I argue that Card's account of evil does not accommodate the kinds of harms inflicted on ecosystems and such nonhuman individuals as trees. I consider the possibility that Card intends a much broader version of evils than the language of the atrocity paradigm lets on, with its attention to sentience and dignity. I'm so persuaded by the atrocity paradigm, however, that I retain the centrality of suffering and introduce the idea that atrocities are intuitively massive, that is, done to groups or generations and not an individual person, animal or tree, so that the paradigm encourages us to think of evil as it relates to far more holistic entities which include the sentient. I suggest we bite the bullet and accept that evil does require the sort of suffering that only sentience can give rise to, which is not to say we let out trees but says rather that it is impossible to identify wrongs to ecosystems and groups that are not also intertwined with the fates of their sentient dependents. I conclude that Card is right to emphasize victims' suffering as a chief component of evil, and that the ontology of what constitutes a victim must be interpreted broadly, not the notion of suffering.